Last year at SXSW, Charlene Li gave a great presentation on Social Media Networks and how they will soon be "like air" (naturally, everywhere). She presented the following slide and the diagram got me thinking about trust. 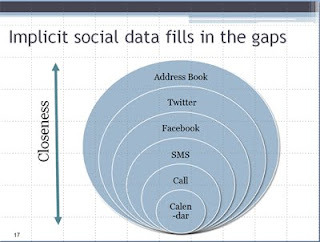 As context, Li was talking how, beyond the contact lists, implicit data helps fill in gaps about the level of closeness or intimacy individuals have with each other. She went on to talk about how this will change in the future based on usage patterns detected by Google and other social networks... painting a picture of a future "social algorithm." I don't disagree with Li's assertions at all - in fact I think she's spot on. It's the slide above that kept coming to mind. Taking that graphic at a literal level, I don't agree that the implicit data represented above really does help fill in gaps regarding people's relationships in any way other than a subjective one - nor do I think it reflects any kind of accurate indicator of an individual's level of "closeness" or "intimacy" with others (trust). Incidentally, I'm not sure Charlene actually asserted this... I believe the slide was used in a figurative manner. But it still got me thinking about both sides of the trust equasion. How do individuals (specifically with regard to social media) think about trust with regard to other people? How do marketers look at Trust in the networked economy? Playing off the concept of "circles of trust", we see an outward radiation of trust and intimacy. At the "inner circle" there is high trust. 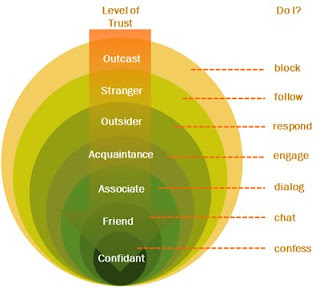 In the outer circle there is "no trust" In further examining trust dynamics, it's fair to assert that people tend to transition back and forth between spheres, depending on events, mood, conversation, disposition and other factors. If you buy this concept, trust, or intimacy is therefore somewhat fluid. It's also device and technology independent (although the actions at the right of that diagram show how I might interact with individuals using social media terms). We'll come back to this in at the end. Looking at individual trust from a marketer's perspective, there are probably three core areas of consideration marketers want to examine when targeting "high trust" individuals. For example, I might trust Beth Kanter as an authority on non-profits and social media. However, I might not trust her as a good referral source on which flat screen TV I should buy. As such, voice is a critical area of examination related to targeting high-trust individuals. 2. REACH: Examining the network of the individual is also an essential component of targeting. This includes an understanding of the person's online and offline influence, across traditional media channels (e.g. television, print, etc.). 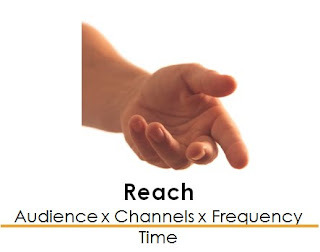 In the online channels, reach examines the size and scope of the individual's active network within various sites and networks, as well as the frequency of communication that occurs. Furthermore, examining how the communication and dialog flows across online and offline channels may be germane to gauging the efficacy of an individual's reach. If influence directly impacted by the ebb and flow of trust within an individual's network, it it's important to note that influence is also somewhat fluid and relative. And all of this is already measured as a factor of time. The sticky challenge is measuring the level of trust individuals have within their network. The truth is this: As outsiders, we can only gauge an individuals relationship on a trust spectrum based on a myriad of attributes, including length of relationship, messaging frequency, physical relationship, public/private discourse, "lists", discussion topic(s), sentiment, recent events, real-world connection and other complex and sometimes esoteric factors. In the end, some of this data will be available and some will not. As such, the outcome is somewhat likely to be somewhat subjective...depending on the time frame reviewed, quantity and amount of information analyzed (etc.). Love your trust spectrum, Leigh! 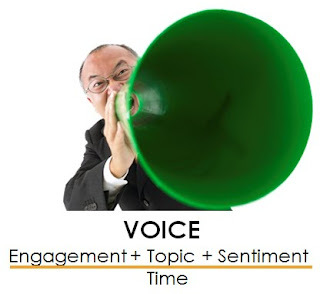 Still puzzling over what a marketer is to do with the voice/reach/influence values. Is the goal to have one's BIZNESS persona achieve high levels of each in the Social Mediaverse? Or is a marketer's goal to FIND individuals at the top of those three ladders and connect with them? Keep going, you have me intrigued! Leigh, this is thought provoking; got me thinking about individuals having some kind of a "trust" score or rating based on interractions whether via social media or other ways of communicating. Please go on. I don't even think I know where I'm going with this. Human classification scores come to mind. Does this make any sense? Excellent post. I think that a good deal of what you've laid out could be gathered and analyzed easily using data captured across social networks (if privacy allows). That would certainly allow for scalability and lowering measurement/segmentation costs, which I see as 2 of the big problems today. My first thoughts, as indicated in my tweet, stemmed from my reading of Thackara's In the Bubble, particularly the chapter on The Nemawashi Factor. People are so into the quickness of communication these days that they miss the importance of time. I was initially struck by the fact that time was the denominator of your "equations" for voice and reach and, implicitly, through those two variables, influence. Trust and time go together. You don't microwave trust out of a box, or adwords campaign, there are no instant values for it. 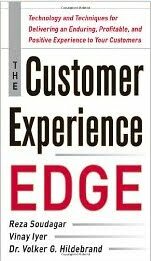 Unfortunately, not enough "experts" in the experience design and social media space have endured hard knocks long enough to appreciate that hard fact. Time will tell (pun intended!) whether the rest (those key influentials now forming social business companies) get there soon enough to make a difference so that the web 2.0 thingy doesn't ossify into a fossil before it becomes a dinosaur. Thanks for your comments. I'm not sure where this is going yet, either. Really, I'm just thinking out loud and wondering what all of you - my valuable, smart and often more prolific than I will ever be network. At a more granular level, I guess I'm thinking about "the new targeting." While it won't replace traditional targeting - the new targeting might examine how to focus marketing spend by targeting influencers to maximize marketing spend. Think of it as "cost per individual". Perhaps my click is worth less than Scobles... perhaps my click is worth more than Mary B. Homemaker. After all, my web properties are judged in much the same way. Without question, we have a way to go in getting the metrics aligned... and I believe there will be very important privacy considerations at stake, also. I'm crafting an additional post about that. Great stuff here, Leigh. The highest level of trust comes from personal interaction and engagement. I'll use you and me as an example. I met you in person at SXSW this year. We got to hang out, talk shop, and share personal stuff such as our faith. Before I knew you in person, I might have trusted you as being a good source of information and knowledge. But now that I've met and engaged with you, you have a lot more influence with me. Larry - Thanks! I think the idea of "gift giving" is so powerful. I think of it a bit differently from the standpoint that 1) I always try to provide value and 2) Congruent with the principles of "Managing by Influence" think of things in terms of social capital (or as Tara Hunt puts it, Whuffie) ... our time, our attention, our responses are all part of the currency here... what we give we will get back liberally. Understandably, marketing folks want precise tools for measuring influence and trust-worthiness. But the "models" touted by SM experts don’t seem very convincing. This is a rich area to explore, and I think you’re asking good questions. Your statement "it's fair to assert that people tend to transition back and forth between spheres, depending on events, mood, conversation, disposition and other factors." is so spot on! Until someone reaches that inner circle, they will radiate back and forth between the levels. I think that one of our goals, as marketers or social media consultants, needs to be sure that our clients understand this spectrum. We need to ensure that they clearly know where they want people to fall and where they can realistically expect people to fall within the scale. The value of trust can never be overstated. 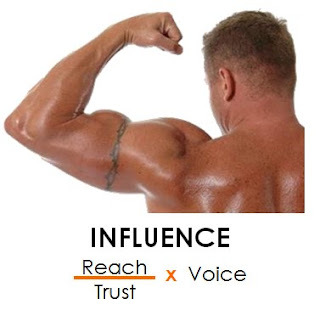 The question remains how do we, personally, and as partners to our clients, find the right balance of voice/reach/influence to effectively reach our goals. Very thought-provoking post. It really has my wheels spinning. Beth would likely know what a good TV is. Trust me (har, har), she's a geek at heart. @Geoff- so it's about context, too! LOL! I hope to someday know Beth like you know her. ;-) Thanks for your comment!